Are you Satisfied With Your Dust Collection Equipment? Have you ever experienced plugged filters, high emissions or other system problems? If so, you’re not alone. Industry experts estimate that 80% of all dust collectors do not operate satisfactorily! The reason: Proper design and selection of dust collection equipment is a complex task. Doing it right involves comprehensive analysis of the challenge contaminant, system operating conditions and many other factors. Yet all too often, equipment decisions are based on guesswork rather than FACTS. As a result, many dust collectors do not perform as expected. Camfil APC recognizes that a dust collection system is a major capital investment and – if it’s not functioning properly – a costly operating expense. 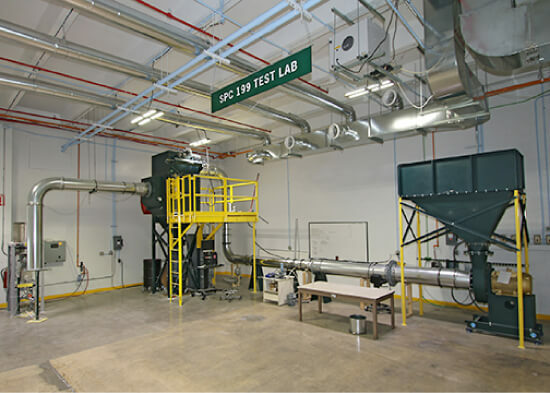 So to help you invest wisely, we’ve built a state-of-the-art dust collection test facility that’s unparalleled in the industry. Here, we can perform a battery of tests on your sample dust, including simulated challenges that no other manufacturer can equal. We analyze your performance requirements in depth. We use this information to develop the best collection system for your needs. No guesswork. No assumptions. This reveals the dust's particle size distribution down to the submicron range. This information determines the filtration efficiency required to meet emissions standards. 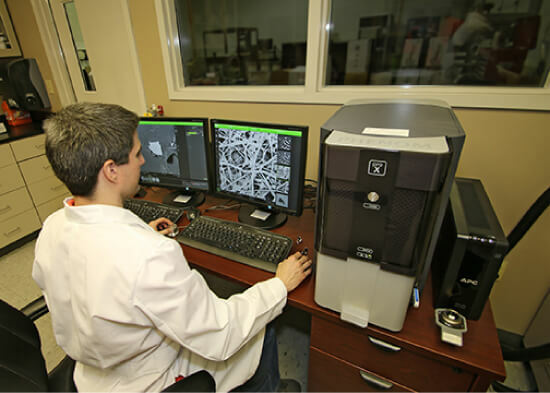 The dual-laser particle analyzer shown in Figure1 can pinpoint both the count (the number of particles of a given size) and the volume or mass spread of the dust. Knowing both is important because many dusts are mixed. 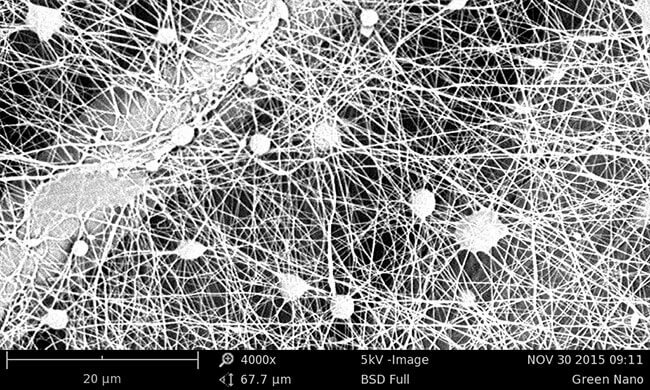 Scanning Electron Microscope 4000x magnification provides clear view of nano fibers on filter media. This testing apparatus determines the true specific gravity of the dust as opposed to the bulk density. Specific gravity is the weight of a given material as a solid block. For example, aluminum weighs 165 pounds per cubic foot. Bulk density is the weight of the same material in the form of dust. For example, flame-sprayed aluminum dust weighs only 1 to 2 pounds per cubic foot. Pychnometer testing can help to determine the efficiency of cyclonic-type dust collectors. This equipment measures a dust's moisture percentage by weight. This information can help to prevent or troubleshoot moisture problems that could affect filter performance. A humidity chamber is used to see how quickly a dust will absorb moisture. This test helps to identify hygroscopic (moisture-absorbent) dust. Hygroscopic dusts require widely pleated filter cartridges or bag-type filters, as these sticky dusts cause tightly pleated filters to plug up. This measures the relative abrasiveness of dust. This knowledge helps to determine the optimal design of dust-handling components, including valves, inlets, and ductwork. For example, when capturing a highly abrasive dust such as cast-iron grindings, the collector must be designed with low inlet velocity. If inlet velocity is too high, the dust will abrade the filters and cause premature wear. This pinpoints the air velocity required to lift the dust. This information helps to determine correct filter housing size. Horizontal convey velocity testing reveals the optimal velocity needed to move the dust horizontally, aiding in proper ductwork system design. Sliding angle/angle of repose testing determines the angle at which dust forms freely, aiding in hopper and dust discharge design. This test further identifies whether the dust tends to stick or agglomerate.